The most complex and expensive dilemma in remote dive exploration is the capability to fill scuba cylinders on location. Generating the substantial amounts of breathing gas needed for technical diving operations while on site is almost impossible without a cascade of bank cylinders and a large portable compressor. Even though rebreathers require about 1/15th the amount of gas volume, they still require the capability to compress gas to desired higher pressures. To solve the problem of the higher pressures needed, restrictions for weight and space during travel, and the limited amounts of oxygen and helium in remote world locations, Gordon Smith of Jetsam Technologies has designed a miniature gas booster. Cleverly called the Baby Booster, Gordons design is intended for the rebreather enthusiast only. This small, lightweight, and portable unit is the perfect answer for mixing and filling small rebreather cylinders anyplace on the planet. What is a gas booster? 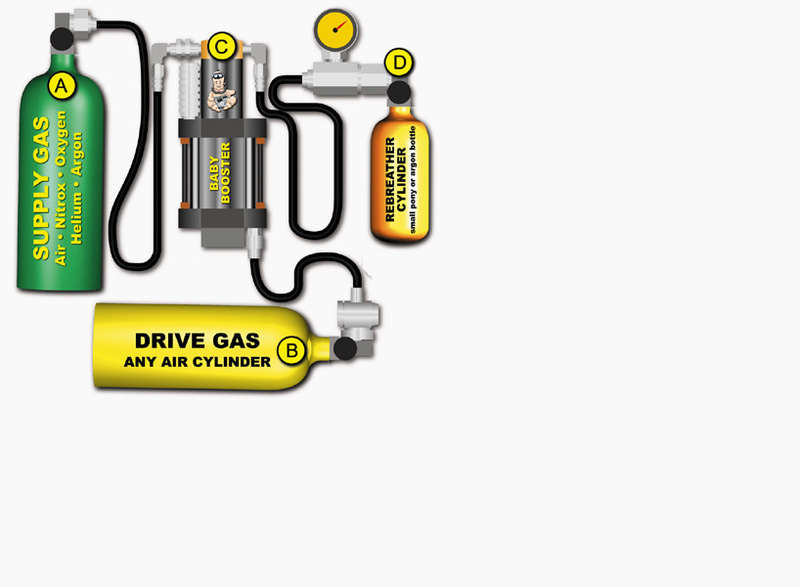 A gas booster takes gas from a lower pressure cylinder, transfers it into a second cylinder, and raises it to a higher pressure. A booster can be driven electrically with hydraulic pressure, or, in the case of the Baby Booster, by compressed air. Using compressed air is probably the least efficient method of powering a booster; but, in some cases, it is the most convenient. Remember the pictures of some of the major cave expeditions? The ones that showed the trailer full of K bottles? Those bottles were not intended for dive gas, but to drive a gas booster. The problem with an air-powered booster is that the drive gas consumption goes up logarithmically as the supply pressure decreases and the fill pressure increases. A. The gas to be boosted enters the booster from the supply tank. Supply gas can be any gas or mixture of gases, such as air, nitrox, oxygen, helium, heliair, trimix, or argon. The Baby Booster will continue to compress gas from the supply cylinder until it drops below 500 psi. B. The drive gas, which should be set to 147 psi (10 bar), (normally air from a scuba cylinder) is used to compress the supply gas and transfer it to the fill cylinder. The booster will continue to operate as long as adequate pressure is maintained. C. Due to the surface area difference between the cylinders pistons (23:1), the drive gas can raise the pressure of the fill tank to 3000 psi/210 bar. D. The ending result is higher pressures obtained of desired breathing gas without the need for gas or electric powered compressors. This allows the diver to fill small rebreather or pony cylinders almost anywhere on the planet. Designed for the traveling rebreather diver, the Baby Booster is not recommended for filling anything larger than a 30 cubic foot cylinder. If you wish to fill a set of doubles and vacuum your helium banks, the Baby Booster is not the right tool. For these purposes, it would be best to use a much larger Haskel or Masterline booster. One of the more difficult questions to answer is how long it will take for the Baby Booster to fill a cylinder. If the tank to be filled is a steel 13 cu. ft. at 2300 psi, and the supply cylinder is a K bottle at 2400 psi, the answer would be not long at all. In fact, you probably wouldnt even have to turn on the booster. Change the situation to adding 500 psi of helium to bring your double 121s up to 3000 psi, and your helium tank has only 400 psi in it. The answer then is just slightly less than infinity. While you are at it, youd better order a bunch more drive gas cylinders because the drive gas consumption is at its maximum when the fill cylinder approaches its final pressure. This is unrelated to how much gas it pumps with each stroke.  What is the cylinder size and beginning pressure of the supply tank? The higher the supply tank pressure, the faster the booster will transfer gas. As gas is removed from the supply tank, its pressure is falling. The larger the tank, the slower the rate of pressure drops.  What is the cylinder size and beginning pressure of the fill tank? Are you trying to fill a small 13 cu. ft. cylinder starting at 0 psi, or a 30 cu. ft. cylinder starting at 2000 psi?  What is the gas being transferred? Argon pumps faster than air; air pumps faster than helium. Oxygen, nitrogen, and air all pump at about the same rate, while pumping helium is the slowest and produces the most heat.  What is the temperature? Both the ambient temperature and the temperature of the booster are important. 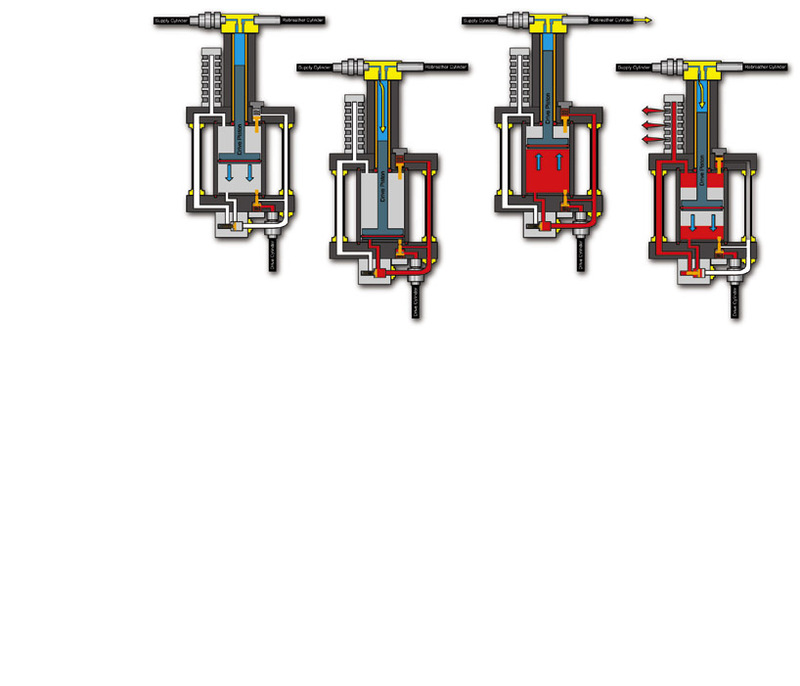 The greater the difference between the supply and fill pressures, the more heat will be generated by the booster. The hotter the booster gets, the less efficiently it pumps. 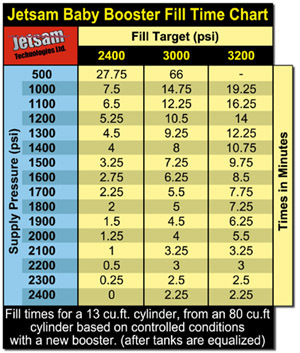 The chart shows typical fill times at various starting pressures using an aluminum 80 cu. ft. (12L) as the supply tank and a 13 cu. ft. (2L) as the fill cylinder. There are two pressure ratios involved with pneumatic boosters. One pressure ratio is the theoretical area between the drive cylinder and the boost cylinder. On the Baby Booster, this is 23:1. At the maximum drive gas pressure of 10 bar (147 psi), the outlet pressure should reach 230 bar (3381 psi). In reality, there is some leakage, seal friction, and gas compressibility to take into account so that the maximum will be in the 210-220 bar range (3087-3234 psi). The second ratio is the difference between the supply gas pressure and the maximum outlet pressure. 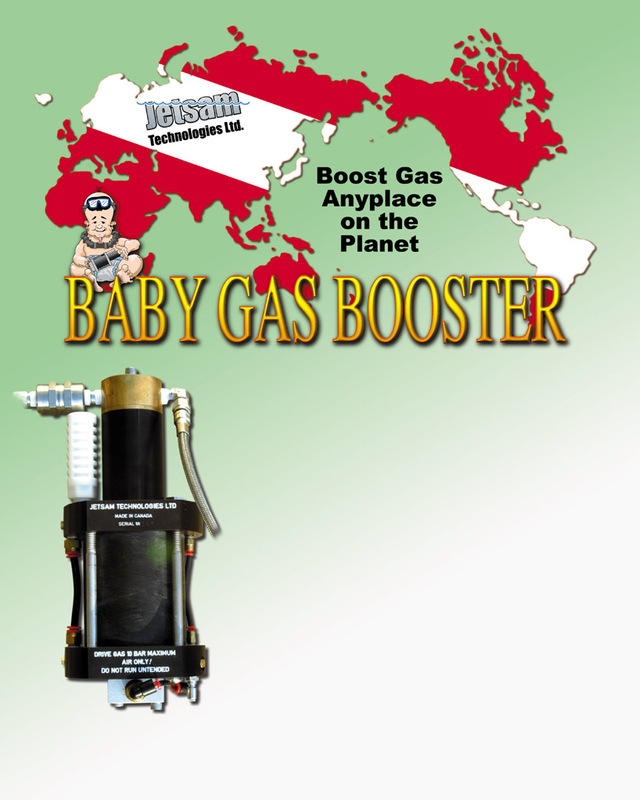 The Baby Booster is rated for 5:1 for most gases, and 3:1 for helium due to the greater compressibility of this gas. The Baby Booster is so small that even tiny leaks in the system will seriously reduce its efficiency. A slightly damaged o-ring on the fill whip can leak gas at a higher rate than the booster can pump. Also, minor contamination on the reed valves can cause internal leakage that can prevent the booster from pumping. (7.068/0.307=23.02) the LP piston, which works at a pressure of 147 psi can move and compress up to 3000 psi/210 bar. Therefore, every pound of pressure on the drive piston exerts 23 pounds of force on the small piston. Incoming supply gas pushes the piston down. When the piston hits bottom, it turns on the drive gas to begin pumping up the fill tank. Drive gas pushes the piston to the top of the stroke and turns off the drive gas. Supply gas again pushes the piston down and the used drive gas exits through the muffler. The operation of any booster has some inherent risks, especially when pumping oxygen. Anyone using a booster should have completed an approved course on gas blending, and should be aware of these risks. Some basic assumptions should be made about the gas boosting circuit, and the first one will probably surprise you. The system is contaminated, and is not oxygen clean. Oxygen clean and its cousin oxygen compatible are two of the most misunderstood phrases in diving. Oxygen compatible depends on the temperature, pressure, duration, and desired result. Gasoline is oxygen compatible, if you are trying to start a fire. The most likely points of ignition when using a booster are the supply and fill whips attached to the booster. Opening either of the tank valves too quickly can easily generate enough heat to cause ignition. If the fill whips have quick connect fittings or other restrictions, the risk of ignition is increased. A rebreather and Baby Booster is a great combination for expanding your diving possibilities. The ability to top up your oxygen and diluent tanks quickly between dives, and do it anywhere you have access to Scuba tanks as a drive gas source, opens up almost limitless dive options. The old set of doubles sitting in your garage collecting dust now makes a perfect gas bank.